Haircuts can be difficult for children. 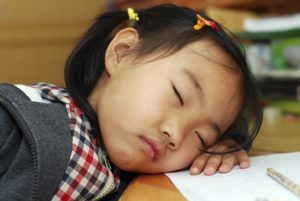 There are many new sounds, sensations, feelings, and smells that might make children feel uneasy. Children might feel uncomfortable with all the unknown objects like hair products, scissors, hair dryers, etc. or they may not like the feeling of neck towels, smocks, or itchy hair falling on their body. The noises of clipping, snipping, and buzzing; being so far from the ground in the chair; and the strong smells can also be overwhelming for a little one. Unfortunately haircuts are not something that will go away with time. Here are some ideas to make haircuts more comfortable. Plan a Visit: Bring your child along on a sibling’s haircut or take your child to the barber shop or salon a couple days before their haircut. Call ahead and make sure this is okay with staff. Ask if they can meet your child and have a walk-through of all the equipment. If possible, arrange for your child to watch a few moments of someone else’s haircut during their visit. This helps them understand the scary noises and feelings they experience during their own haircut. Touch the Tools: Before your child gets a haircut, ask if their hairdresser can show you and your child the equipment that will be used during the haircut. Ask to see and smell any shampoo or hairsprays as well. When children can see what tools and products that are going to be used, they might be better prepared for their haircut. 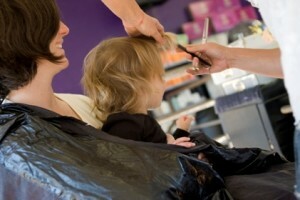 Get Team Haircuts: Offer to get a haircut with your child or before them so they can watch the process. Maybe your child can sit on your lap during the cut. Sometimes even the hardest experiences aren’t so bad when you aren’t alone. Making the First Snip: Sometimes the buzzing of an electric razor can be overwhelming for a toddler or young child. This noise is so close to their ears it sounds magnified. Ask if the hairdresser can just use scissors, and if you or your child can make the first snip. Be the Barber: If your child’s haircut issues continue, you could try cutting their hair yourself at home. Use just scissors and give trims when needed. It might be helpful to give your child a haircut during bath time because the warm water can be very soothing and relaxing. You can easily and quickly wash off the itchy hair clippings with the bathwater. Remember that haircuts can be a challenging experience for lots of kids. Being understanding and supportive of children’s sensitivities is important. Wondering when your child can start doing chores? It is earlier then you might think & chores are good for development. See a list of age-appropriate chores. Next Next post: What is W-Sitting?